Oh, how I love this poem! It packs so much into a short space. 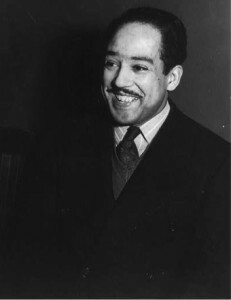 Published on its own in 1949, it was included in Langston Hughes’s 1951 collection, Montage of a Dream Deferred. Though it gains more resonance when taken with the entire collection of Hughes’s bebop poetry, it also stands successfully on its own. In “Theme for English B,” Hughes imagines a 22-year-old black student – a transplant from North Carolina – living at the Harlem Y and going to college. He is the only “colored” student in his class at Columbia University, where Hughes himself had been a less-than-satisfied student in the 1920s. In the poem, Hughes plays with the idea of using writing – words on paper – as a tool to bridge racial, social, class, and educational differences. Through the “theme” the young man is writing, his professor – white and well educated – has the opportunity to learn from his black, yet to be fully “educated” student. The student goes back to his room at the Y and writes his essay, naming things he likes, including music: “Bessie, bop, or Bach.” Being black doesn’t mean he doesn’t like Bach, but there’s a hint here that he may have even greater access to cultural experiences than the white professor, for the student has his foots in two worlds – the white university and Harlem. Though they are located right next to each other, they are nevertheless worlds apart. For ideas on teaching “Theme for English B” within the context of bebop music, an insurgent African American form of urban jazz, see Eric Otto’s fine article in Teaching American Literature. And to explore many other resources related to Hughes and his poetry, visit the StoryWeb episode on Montage of a Dream Deferred, the collection in which “Theme for English B” appears. Listen:Listen as playwright Jermaine Ross reads Langston Hughes’s poem “Theme for English B.” Visit Atlanta-based Jermaine Ross’s website to learn more about his work.